1. YOU WILL GET DISCOUNTS FOR MARINE ACTIVITIES – We offer a wide range of local activities at discounted price such as Scuba diving, Snorkeling, Parasailing, Fly board, Sea kayak and much more!! 2. 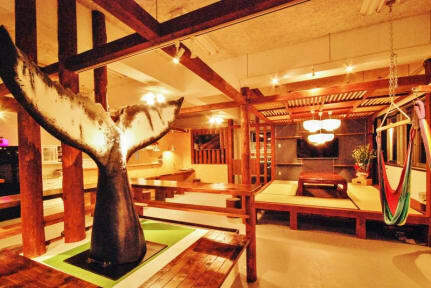 THE LOCATION - We are located besides Naha's main port 'Tomari'. It’s a prime location for those who would like to go to Okinawa’s famous Kerama-Shoto National Park, “Zamami” or “Tokashiki” islands. 3. FREE CAR PARK - You can use our car park free of charge! Okinawa’s main road, “Route 58”, allows you to drive around the island, and is only a minute away!! MY PLACE provides free WiFi throughout the premises. You will have a spacious common area that includes a fully equipped shared kitchen and a wide living room that you can use 24 hours. 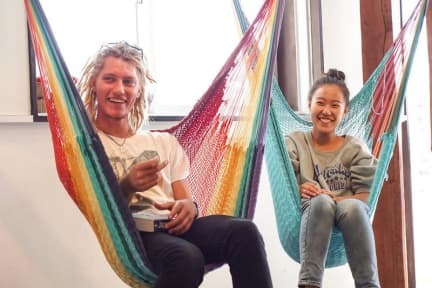 Be sure to check out our hammocks! A wide range of activities can be booked at discounted price for our guests, at the front desk. You could go snorkeling, diving, parasailing, fishing, and more. Selection of bus tours throughout Okinawa that can be also booked at the front desk. Churaumi aquarium, Kouri island, Cape Manza, Ryukyu glass village, for example. MYPLACE also rents out bicycles. My Place offers varied types of rooms, fit for solo budget travelers as well as families or groups. Some rooms offer a relaxing harbor view. Dormitory rooms come with a curtain set on each bed to ensure privacy, as well as individual reading lamps, electrical plugs and fans. Nice hostel near the port! Good position for taking ferries. Hostel organizes outdoor activities to be reserved. Rooms are a bit dirty and bathroom smells bad. Perhaps it needs to increase cleaness turn.